I decided to call this recipe tortilla quiche, but I am not really sure that it is the best name for it. 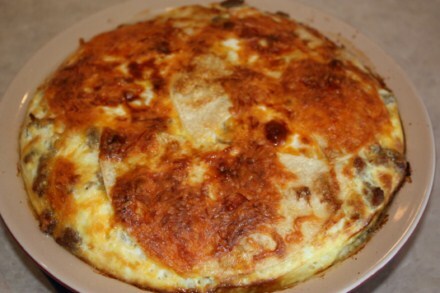 It is not really a quiche, but it sort of is because it contains milk, eggs, and cheese. No matter what you call it, my family really enjoyed this. This is one of those recipes that I just put together. I needed a quick and easy dinner. I had some tortillas that needed used up. I had the rest of the ingredients on hand, so I put it all together in a quiche like dish, and hoped for the best. We ended up loving this. I was so glad because when you just throw some things together and hope for the best, the best doesn’t always turn out. I love this because not only is it quick and easy, it is one of those meals that you could eat for breakfast, lunch, or dinner. My husband thought this needed some spiciness to it, so he added salsa to his. 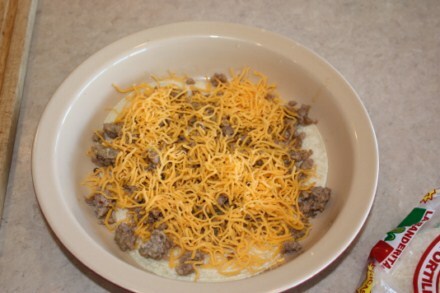 I think you could easily add salsa to this when you are making it, and I might try that next time. 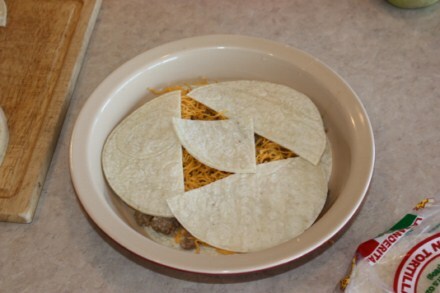 Cut 6 tortillas in half and one tortilla in quarters. Mix together eggs and milk and set aside. 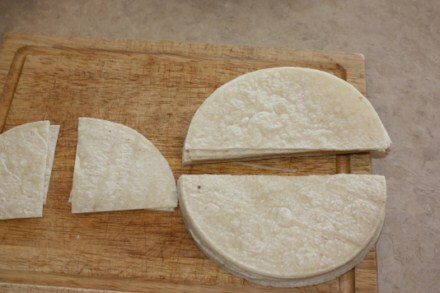 Place on layer of tortillas on the bottom of a 9 inch pie plate or similar type pan. Sprinkle 1/3 of the cooked sausage and 1/4 of the cheese on top. 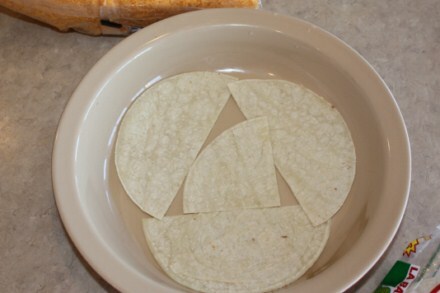 Then place another layer of tortillas on top of that. Continuing layering, ending with tortillas. Bake 375 for 45 minutes or until done. This post linked to Frugal Fridays and $5 Dinners. Hi there! I am dropping in from Frugal Friday. I enjoyed your post. Your photos always make my belly growl! LOL This seems like a great dish for taking to a potluck. My MOPS group does breakfast twice a month and this seems right on for that occasion. Stop by and see me when you get a chance over at Free 2 Be Frugal. Looks like an interesting recipe. I think I may try it for my family. Thanks. YUMMMMMMMMMMMMMMMM! This looks awesome and is perfect for my meat and cheese-loving crowd! Count us IN on trying it out!! Thanks for sharing! i think it’s more like a tortilla relleno. 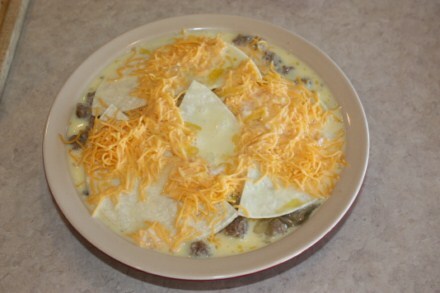 Looks very similar to a chile relleno casserole that my whole family loves. Will try this out soon. 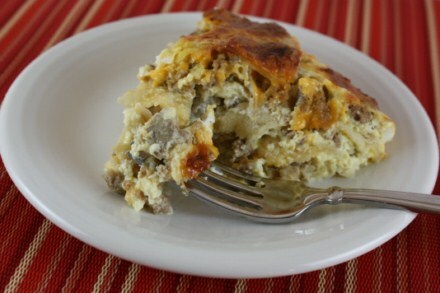 I loved this recipe when I tried it, so we have featured it on our recipe blog! Pop on over and claim your featured button if you would like, and thanks so much! I own an assisted living home and am always looking for quick, delicious receipes. This will definitely fit in that catagory!